Press biscuit crumb into base and sides of tin. Place in fridge for 15min. In a bowl place cream cheese, caster sugar, mandarin juice and zest. Mix with hand blender until blended. Add eggs one at a time until just mixed. Pour mix over biscuit base. Place in oven and bake 35-40min or until centre is set. Leave to cool for 30min in oven. Remove from oven and place in fridge for 2hours. While cheesecake is cooling, make the mandarin syrup. Place mandarin juice and sugar in a saucepan. Simmer until sugar has melted and is slightly thickened. Remove from heat and cool. 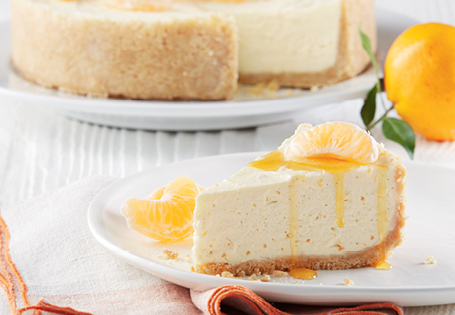 To serve - place mandarin segments around the cheesecake and top with syrup. Serve immediately.